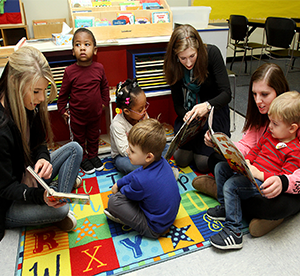 Highland students in the Intro to Early Childhood Education (ECE) classes raised enough money to disperse books to 12 area teachers for a book a month to a total of 335 students from area schools in the Highland Community College district through the end of the school year. The service project was the idea of Melissa Johnson, Early Childhood Education Coordinator at Highland. It was through a Facebook post she saw for a similar program that prompted her to take the idea to her students. Johnson credits Peggy Tell, a kindergarten teacher in the Freeport school district, who teaches part-time at the college, for the inspiration. Each Highland student was assigned a teacher and was in charge of recruiting sponsors for the books, which are purchased through Scholastic Books. The amount of money raised was $3,015. The cost per book per student is $1 a month, for a total of $9 a school year. Teachers are able to set up accounts with Scholastic Books. The added bonus is with each book purchased, points are earned to buy more books. Kendra Rinehart of German Valley is a student in Intro to Early Childhood Education and a pre-school teacher in German Valley. Rinehart said when she heard about the book program, she was excited to help children learn through books. For more on Early Childhood Education classes at Highland and the new Early Childhood Development Online degree, contact Melissa Johnson at melissa.johnson@highland.edu or 815-599-3486.